Hi everyone! I'm going to take a blogging break until after the new year. No worries....everything is good!...promise! :) I'm just going to take a blogging break, that's all. I hope to get back into the swing of regular crafting and blog posting in the beginning of January. I wish you all a VERY good December, Merry Christmas, and a Happy New Year!! Hi all! Long time no crafty posting, huh? Yeah, between Thanksgiving and some other "life" issues, I just haven't had time to paper craft much lately. I did, however, have some time yesterday and this morning (yay!) so I made this card for our friend's son who just turned three years old today. Happy Birthday, Mason!! 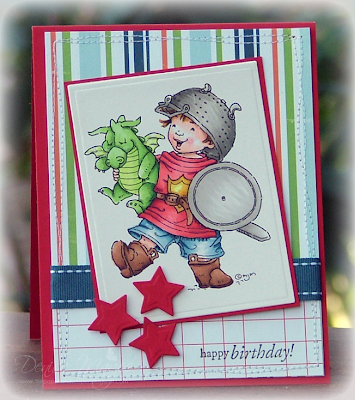 I used Mo Manning's Kitchen Knight digi image, colored it with Copics, and added some Stickles to the dragon's wings. The three Spellbinders stars are up on foam tape. Hope you're all doing well and that you had a nice Thanksgiving. Can you believe it's already December 1st? This year has totally flown by. I'm usually stressed about it being the beginning of December, with all the shopping to be done and knowing there are only 25 days 'til Christmas.....but THIS year, I'm looking forward to a really GREAT December. November was just NOT a good month for me and I'm personally glad it's over....so onto December, I say! I hope it's good to EVERYONE!